Well it was a great evening over at the Sordid Lives Premier in New York City on Tuesday, July 15. Del Shores, the creator of “Sordid Lives: The Series” has done an amazing job in assembling the exceptional cast of stars. 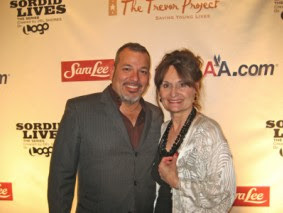 Caption: George Carrancho and Beth Grant, who plays Sissy Hickey in the Series. The visibly pregnant Caroline Rhea hosted the special evening and was amazing conducting the live auction that raised more than $25,000 for the Trevor Project! Lucky winners bid for lunch with Rue McClanahan and Caroline Rhea as well as a few “Sordid Lives” walk on roles. Leslie Jordan often added to the bidding enthusiasm by offering “personal” services that are best left unmentioned. The last and best offer was a walk on role with Olivia Newton-John---although the successful bidder would have to pay for her or his own transportation. When I saw the bidding hovering at $6,000, I decided to sweeten the deal by offering round-trip air transportation along with passes for our American Airlines Admirals Club if someone would bid $10,000 for the new offer. Someone leaped to the chance, and raised an additional $10,000 for the Trevor Project. Photo Credit: George Carrancho Caption: Rue McClanahan, Del Shores, Leslie Jordan, Caroline Rhea and Olivia Newton John have some incredible chemistry on and off camera. Glowing and newly married Olivia Newton-John told the audience a poignant story about her personal connection with the Trevor Project. Years ago, she was heartbroken that a driver on one of her tours later committed suicide, fearful about disclosing his true sexual orientation and not aware that he had a helpline like the Trevor Project to feel safe and protected to talk about being gay. Bonnie Bedelia, exhausted from her train journey from Seattle told us she is thinking about hypnosis to get past her fear of flying! On the screen in “Sordid Lives: The Series,” she was great as Latrelle Williamson, a painfully overbearing mother. 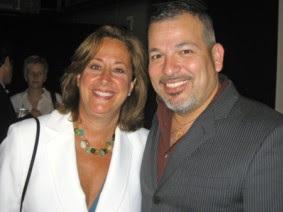 Caption: Lisa Sherman, Executive Vice President and General Manager of LOGO, and George Carrancho talked about American Airlines’ involvement in the series. Bonnie’s husband embarked on his cross-country American Airlines flight as she at last drove into New York State, and he still beat her to the Manhattan hotel. Once she gets over her fear of flying---she promised that she would be flying American Airlines in the future. Logo’s executive vice president and general manager Lisa Sherman spoke enthusiastically about several upcoming episodes that will lead Logo to a crossover cable audience--- although they have not yet picked up “Sordid Lives: The Series” for next year. 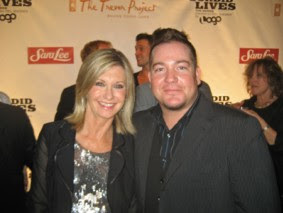 Photo Credit: George Carrancho Caption: Olivia Newton-John and Justin Nelson, Co-Founder of the National Gay & Lesbian Chamber of Commerce finally lived a childhood fantasy by meeting Olivia! But you would not know that the way Del Shores already is planning for the second season! 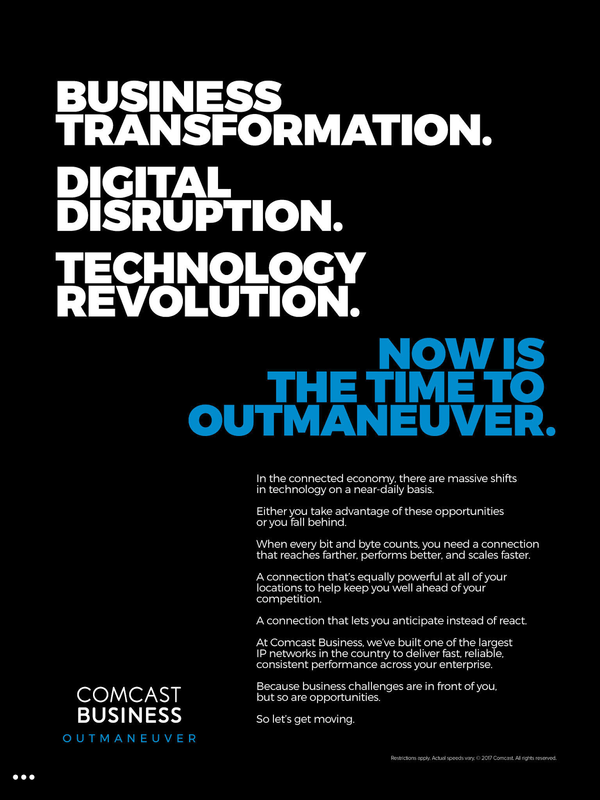 All of us at American Airlines are very proud to play a small supporting role on this long-awaited television production. EDITORS NOTE: The accompanying photographs and comments are available to interested news organizations for editorial consideration and publication. I'm both an airline captain and licensed therapist who has worked on this problem for twenty-eight years. I'm sure I can help. Is That Your Vegas Showing?